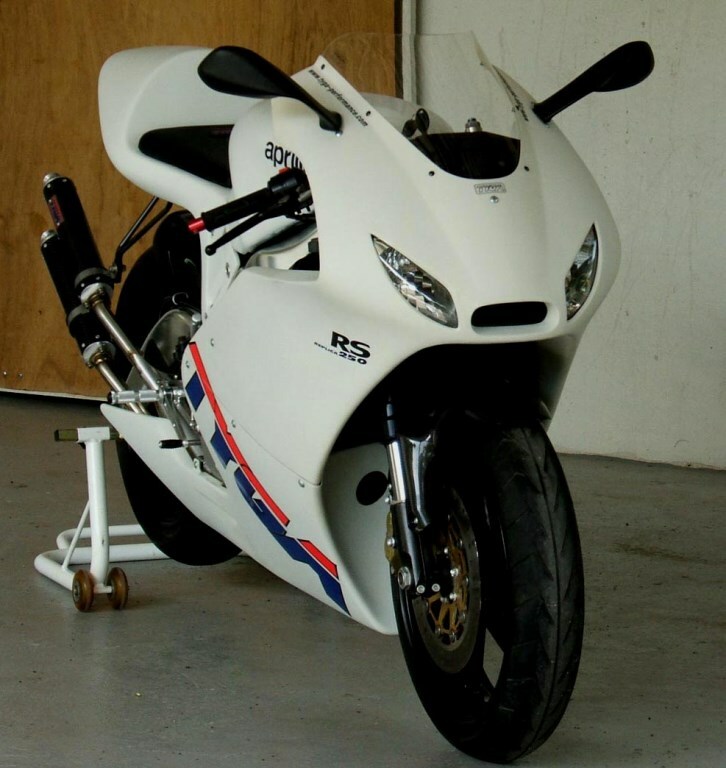 Here it is at long last! Been a long wait but hopefully worth it. 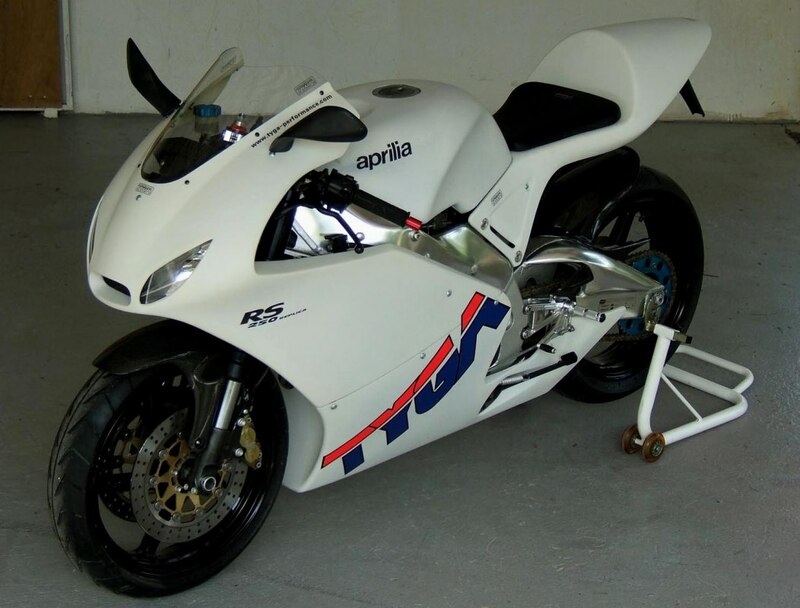 Following from the NSR250 and the RGV250 GP250 inspired bodywork, we received a lot of interest over recent years to make something similar for the Aprilia RS250. We were both flattered and surprised. 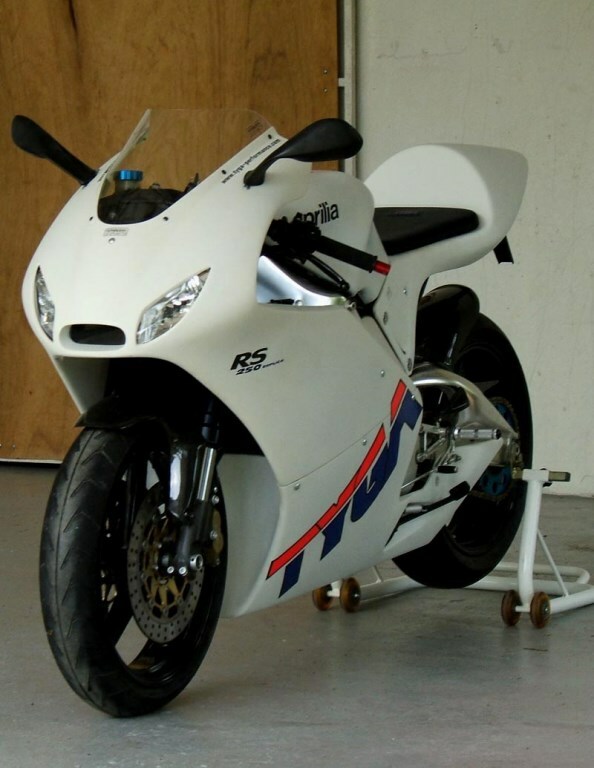 We always considered the bodywork that the street bike is supplied with from the factory bears more than a passing resemblance to the bike that has dominated the World GP250 class in recent years. 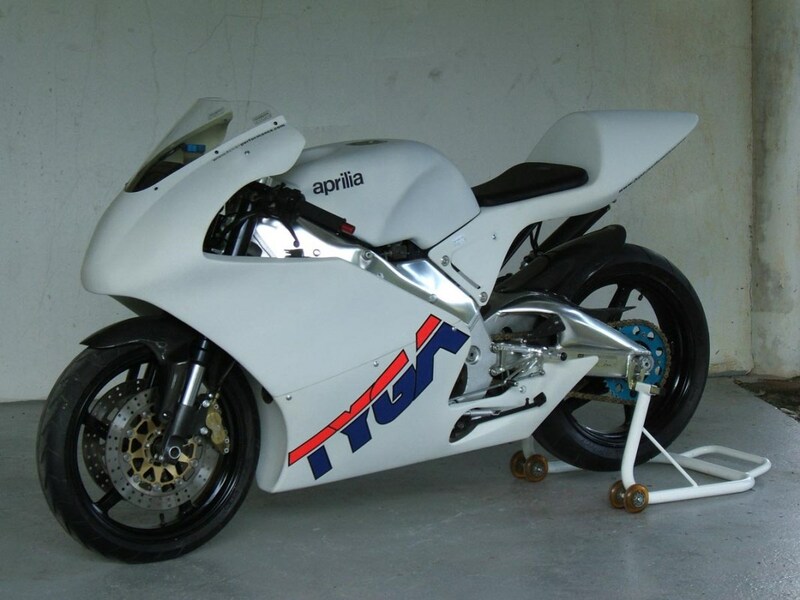 Normally, our starting point in the design would have looked at the factory GP250 bike like we did with the honda and tried to get inspiration from that (we have several accident damaged Aprilia GP fairings from previous Sepang dumpster diving missions). 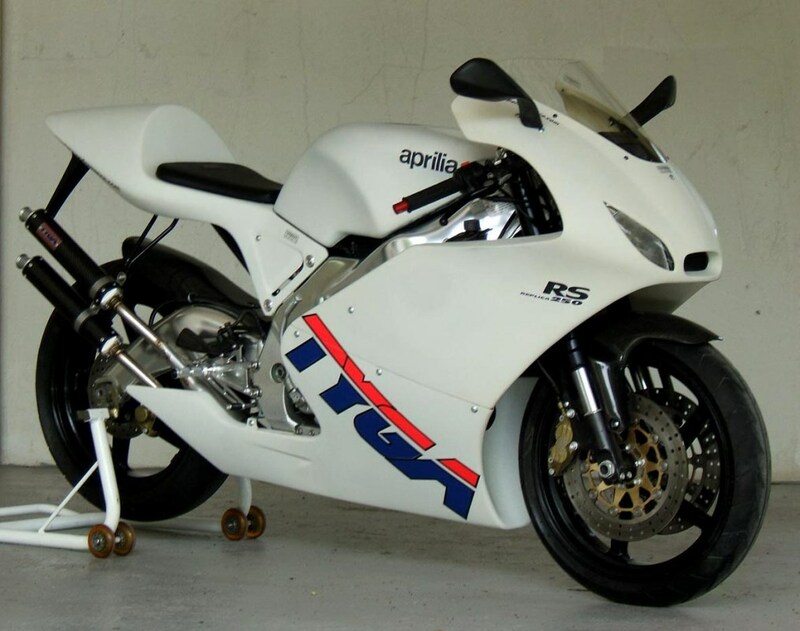 However, if we took that approach, we'd be at risk of ending up with something looking pretty close to the original plastics that we took off the bike. A different approach was needed. 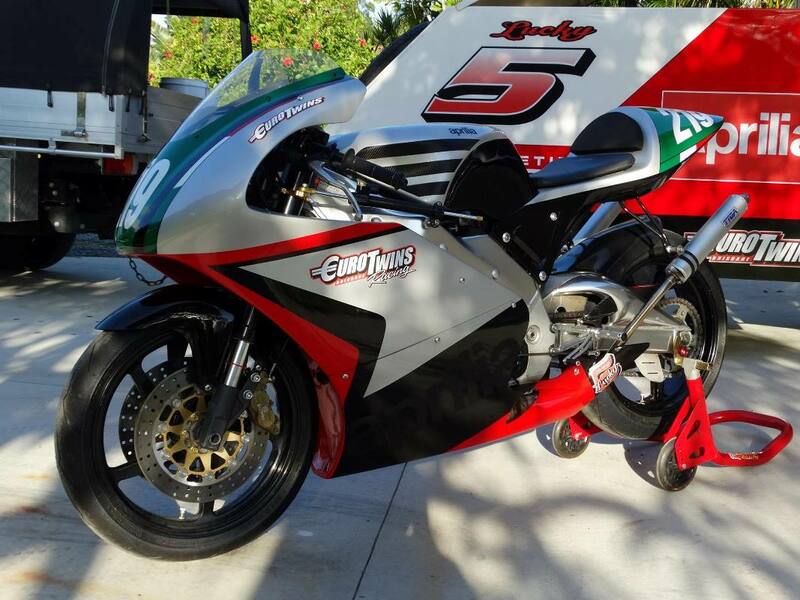 People were already fitting our GP250 bodywork to their Aprilias, so we decided to simply adapt the TYGA Suzuki kit to fit. Well that was the original plan. 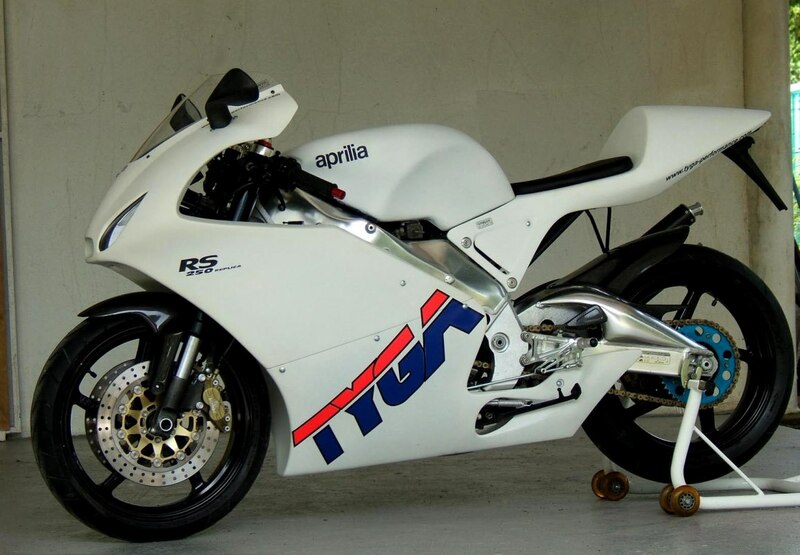 The TYGA RGV fairing looked a pretty good fit for the Aprilia from the start. 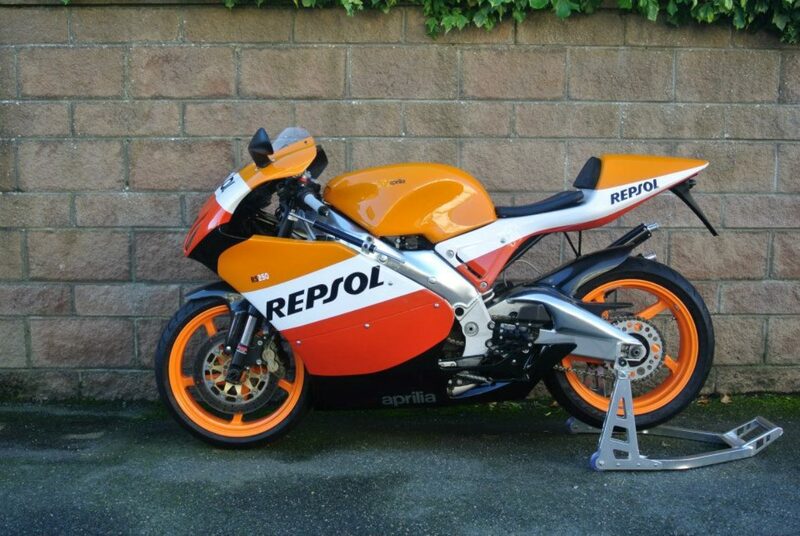 Ok, there were the usual side stand, kick start and foot control clearance issues but nothing very major. 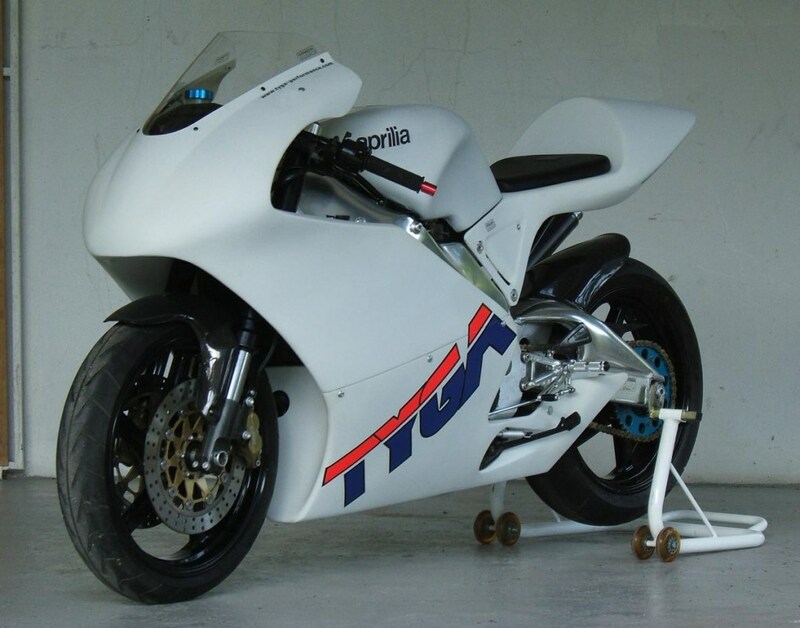 The seat cowling, required reworking on the front section to merge with the Aprilia frame and tank but we wanted to keep the original shape and profile of the kit. 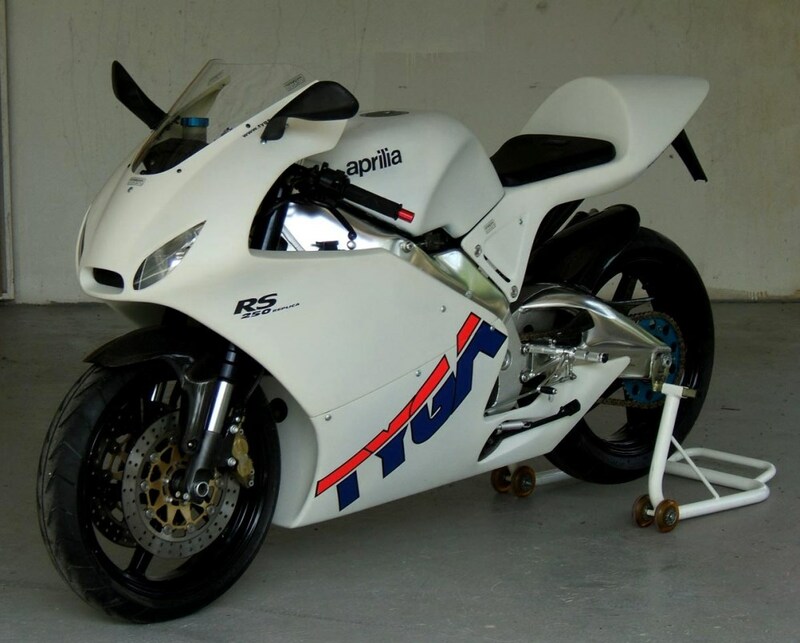 That was the original plan and it always looks so easy...The fairing need to be widened slightly around the middle to allow for the extra width of the Aprilia around the auto lube and the coolant top up tanks and then reprofiled to come back in at the bottom. 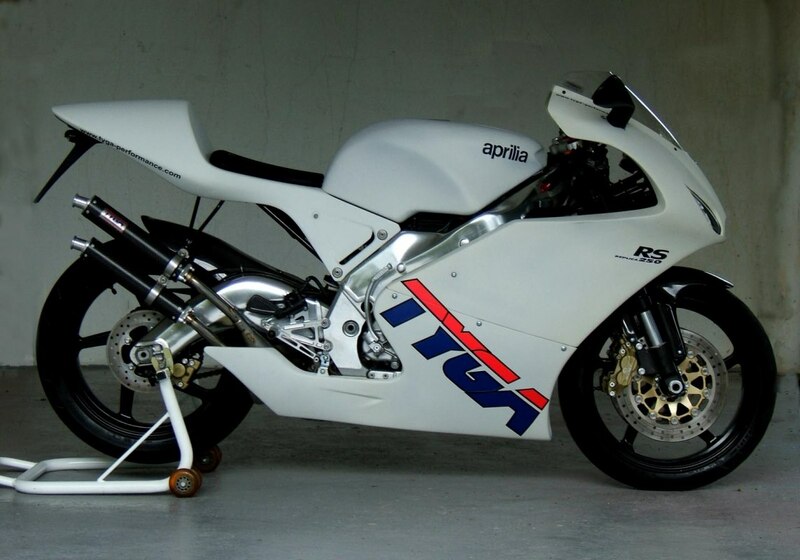 The Suzuki and the Aprilia frames being of a completely different design, required changes to the trailing edge and obviously the inner cowling need to match the Aprilia radiator and the lower triple clamp which has a special cover under it to guide in the air. 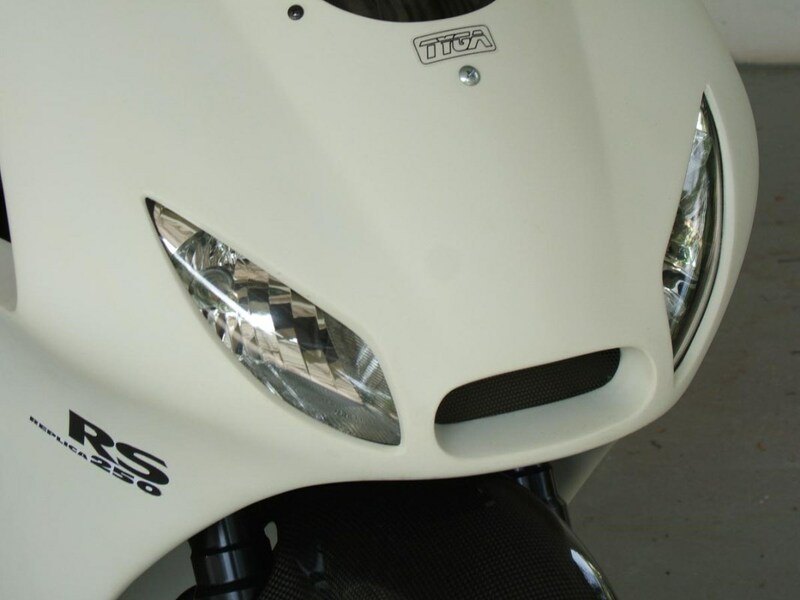 Early on in the design, we had decided on a dual headlight arrangement. 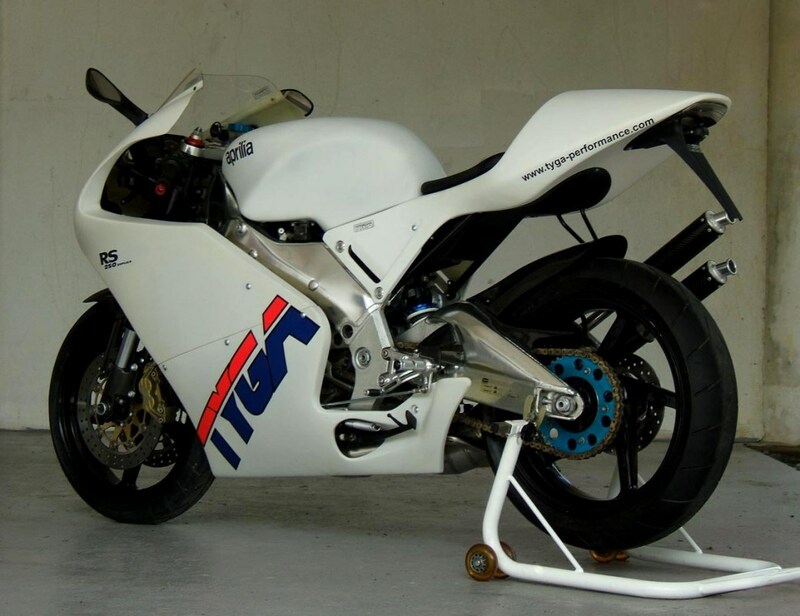 This was to differentiate it from the Suzuki and also to allow for a more effective light beam, which is not the best on our RGV kit. 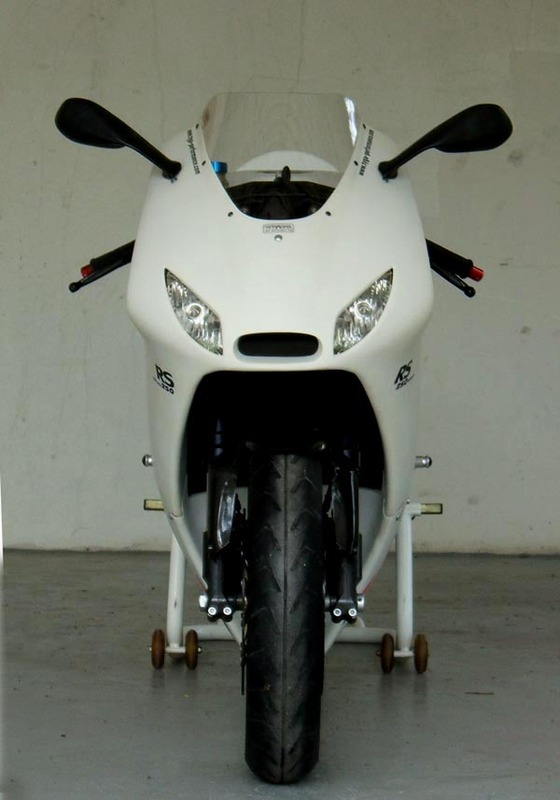 This in turn allowed the fairing upper to be lowered slightly because we did not need to worry about the headlight living where the front fender moves at full travel and this enabled the whole design to become more compact. 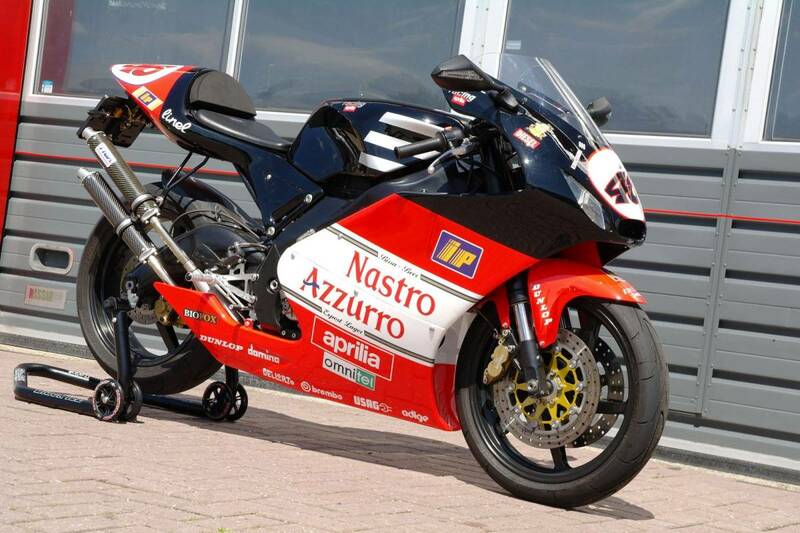 The stock Aprilia fairing we always felt seems a bit remote and far forward for a proper race bike and we were keen to improve on this element with our design. 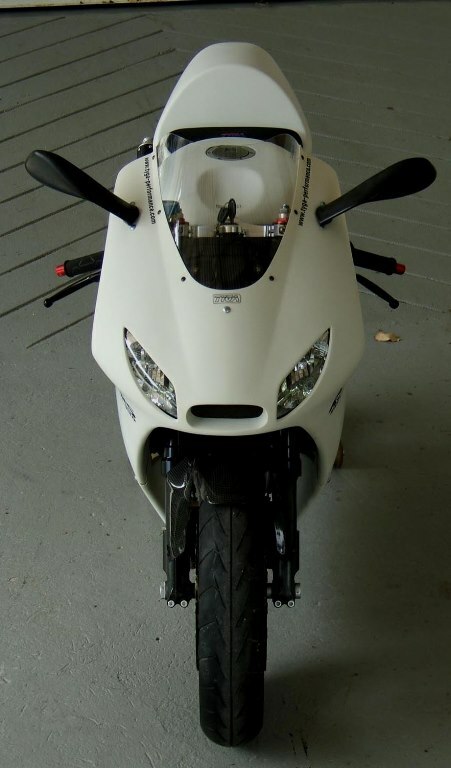 Turning to the lower fairing, we wanted to go for a long and sleek design to match the upper. The lower is all in one piece and extends beyond the original one. 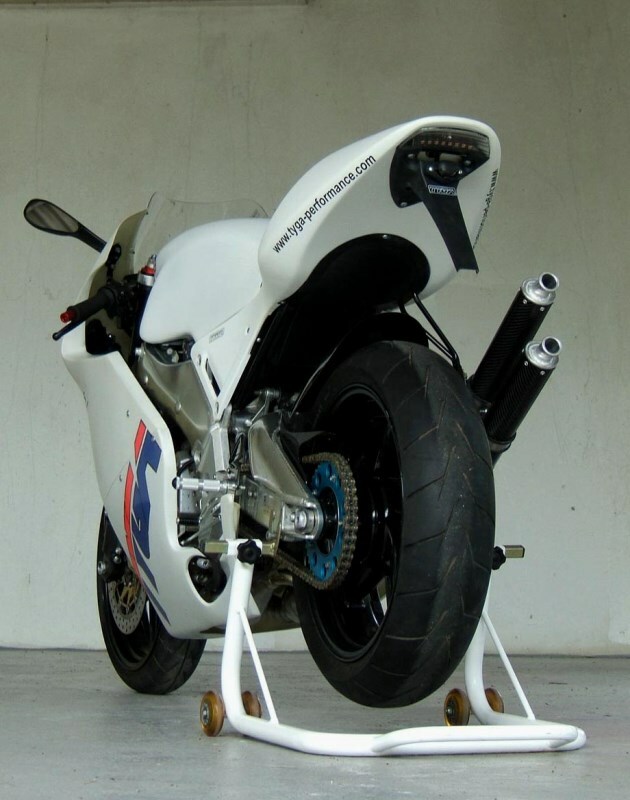 The bottom is split like the original, and this is helpful when getting the fairing to mount with sufficient clearance with the exhaust chambers. 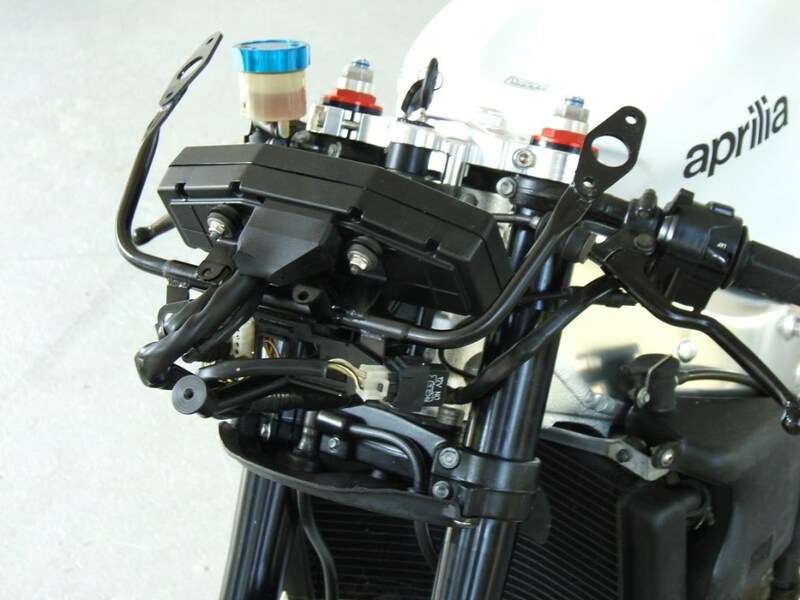 Because of the lower fairing, the kit requires a new meter stay and we supply a variety of lower stays and bushes to allow for the optimum set up for any specific bike's set up. 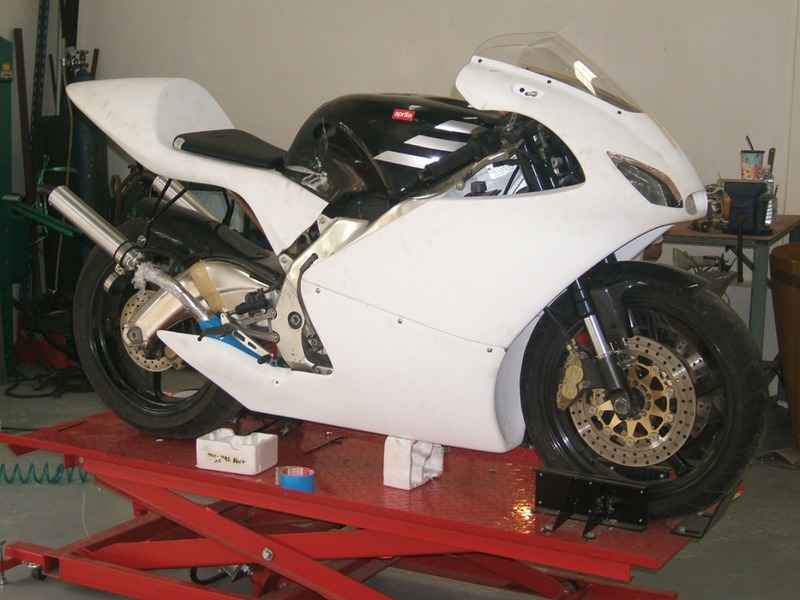 We have designed the fairing so that it can be removed in a race situation quickly and easily. 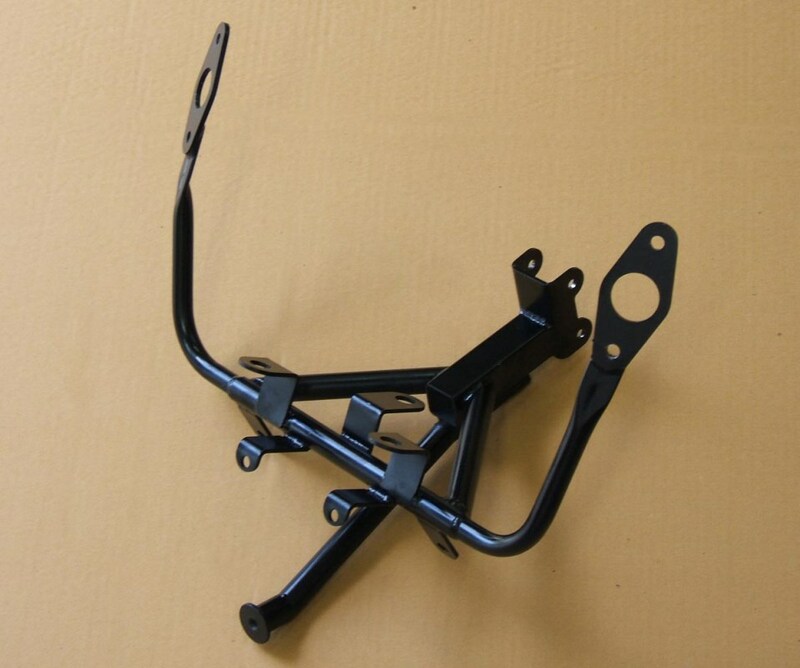 The side mounts and the front mount are held on wth bungs GP style and the side bungs held in with 'R' clips while the front bung is free fitting requiring no securing. 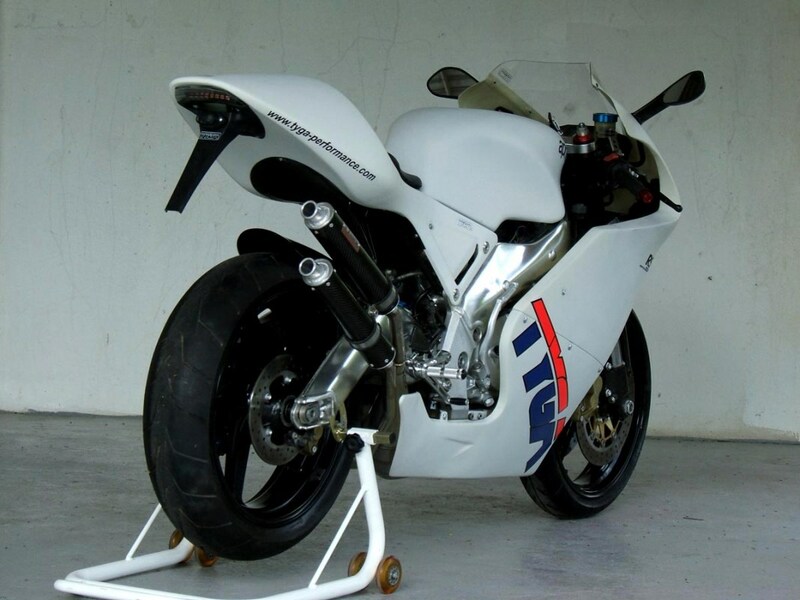 The seat cowling is similar to our other GP250 versions, being a comprehensive conversion. 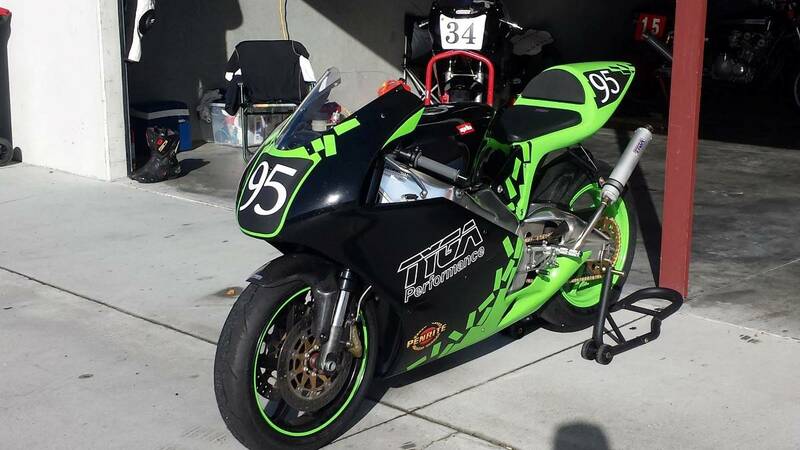 The stock subframe is replaced with a TYGA one and all the electrical and other components have new homes on this to allow for the more slim style seat cowling. 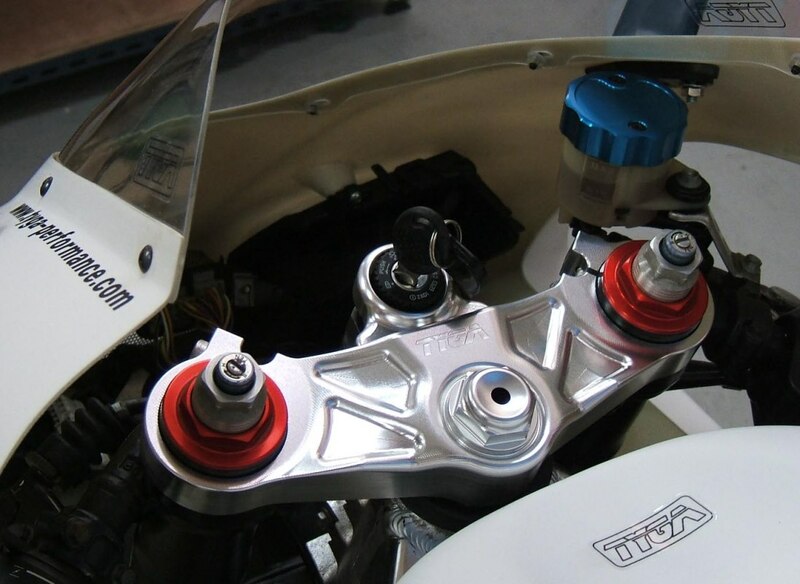 The seat cowling itself consists of main panel which fits over the subframe and incorporates a seat support. 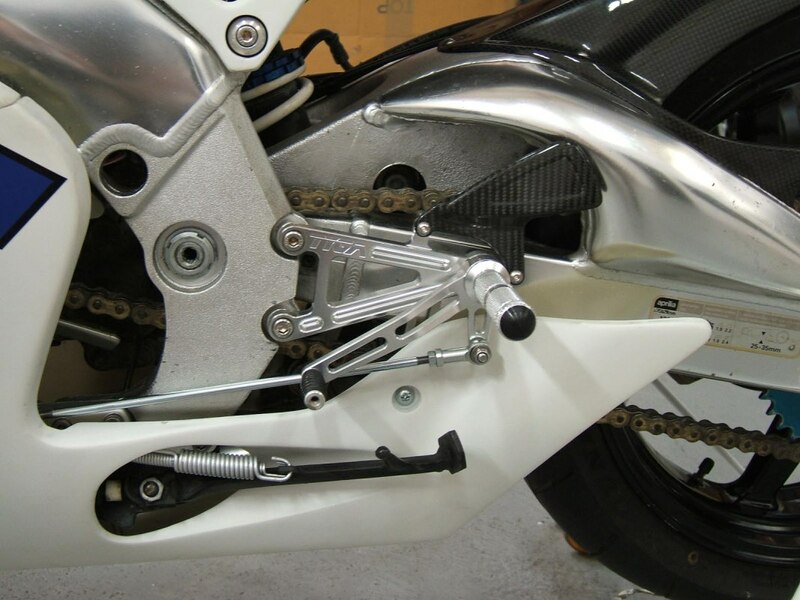 The front section slides over special bushes which are mounted to the subframe mounting bolts to allow for fitment and removal without the need to disturb the subframe. 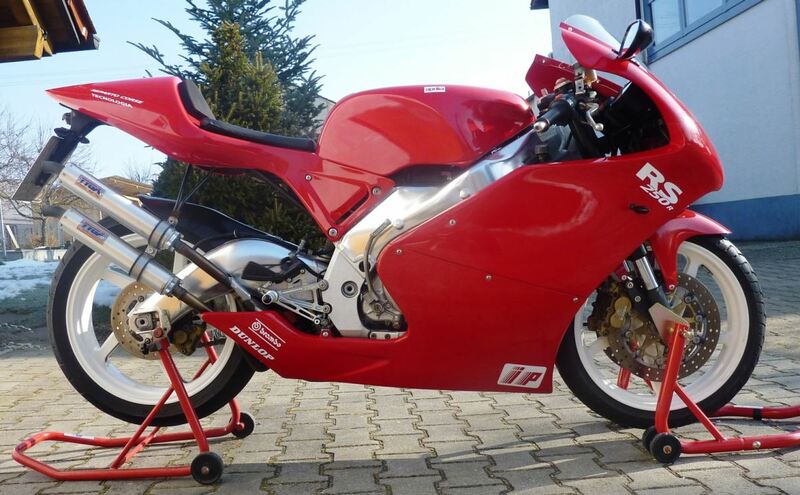 Also, to make jetting changes easier, the tank too can be removed without need to remove the seat cowling. The undertray tidies up the underside and a TYGA seat pad is secured by Velcro in the normal TYGA style. 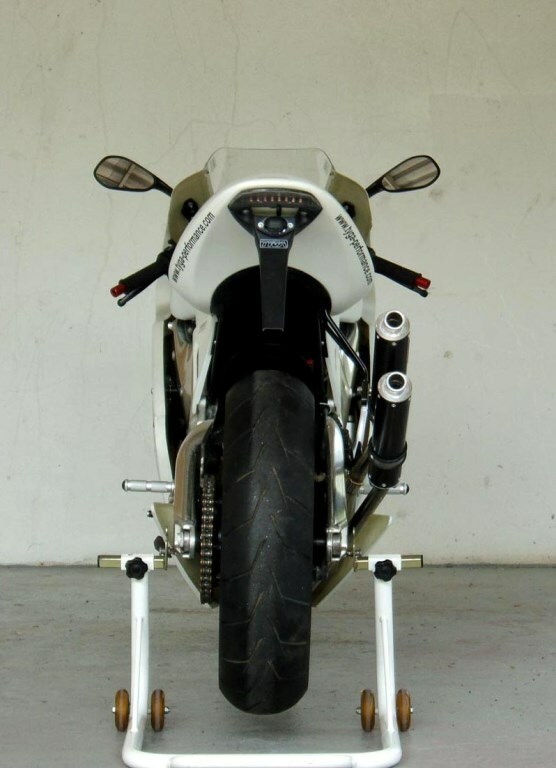 The taillight is our usual LED design and as well as the tailllight, there is a registration holder to which indicators could be mounted if required. 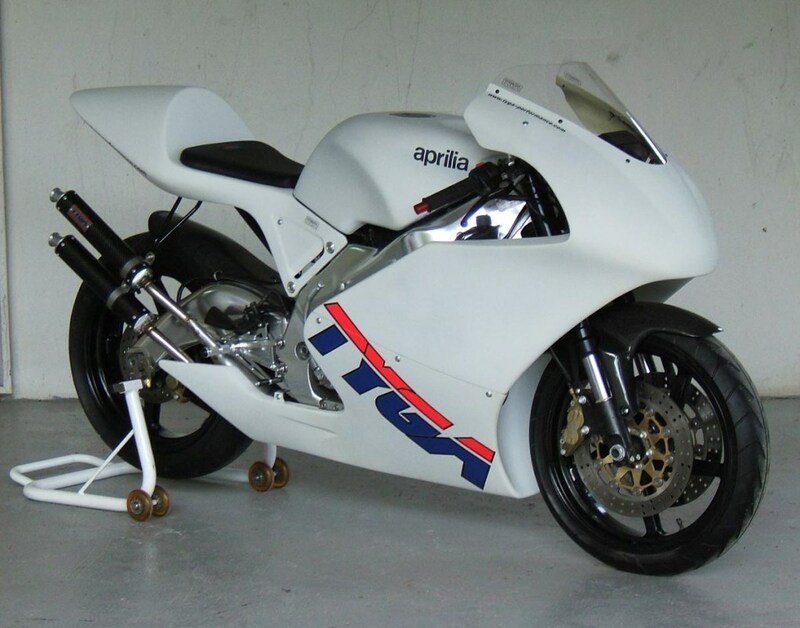 These parts can be substituted for the original Aprilia light pod which fits under the tail in exactly the same way as on the stock bike. This might be handy to comply with regulations. 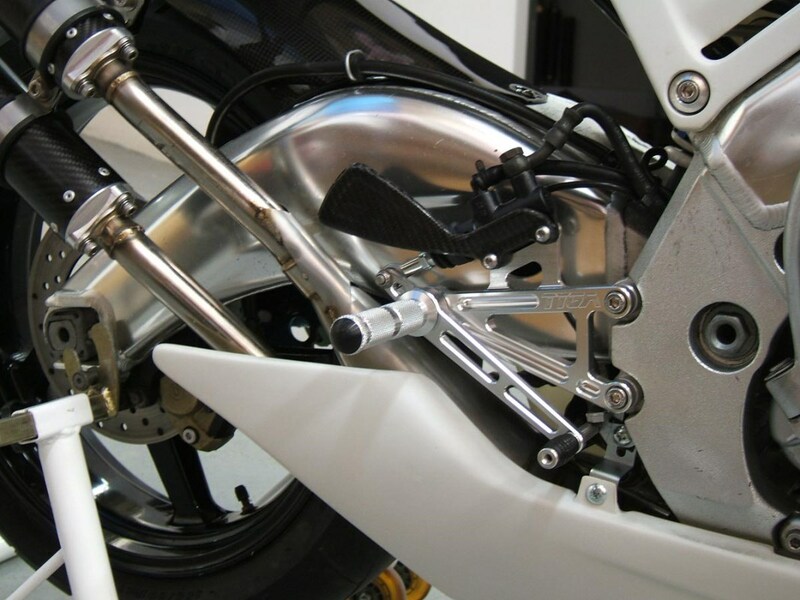 For the race tail, we supply a small cover to fill in the hole left by the light unit. 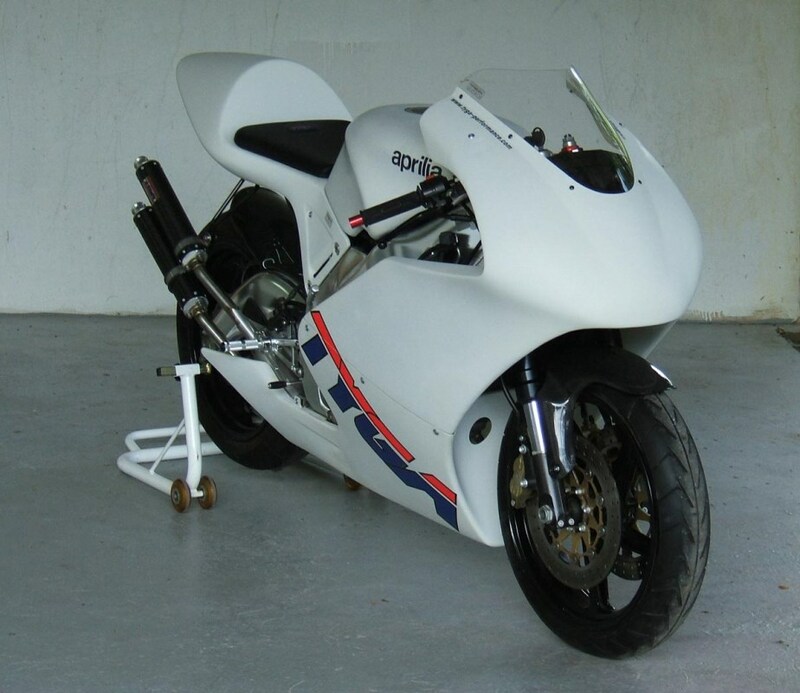 Made from lightweight GRP using top quality epoxy resins and 200 gram mat, the panels are very strong and flexible. The kit is much lighter than the parts they replace and when we get the opportunity we will do some weight comparisons. 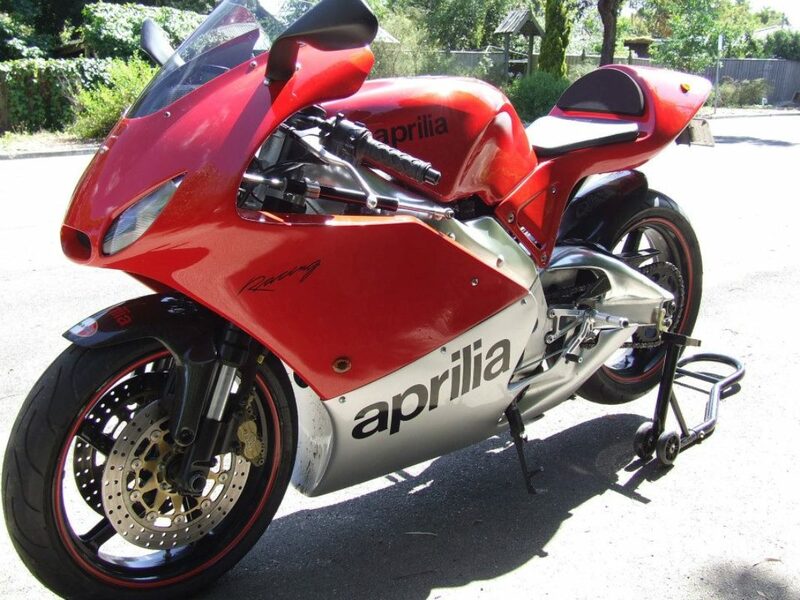 As well as offering practical improvements over the stock bodywork, we hope that the sleek design will be appealing to Aprilia enthusiasts and our loyal TYGA customers. 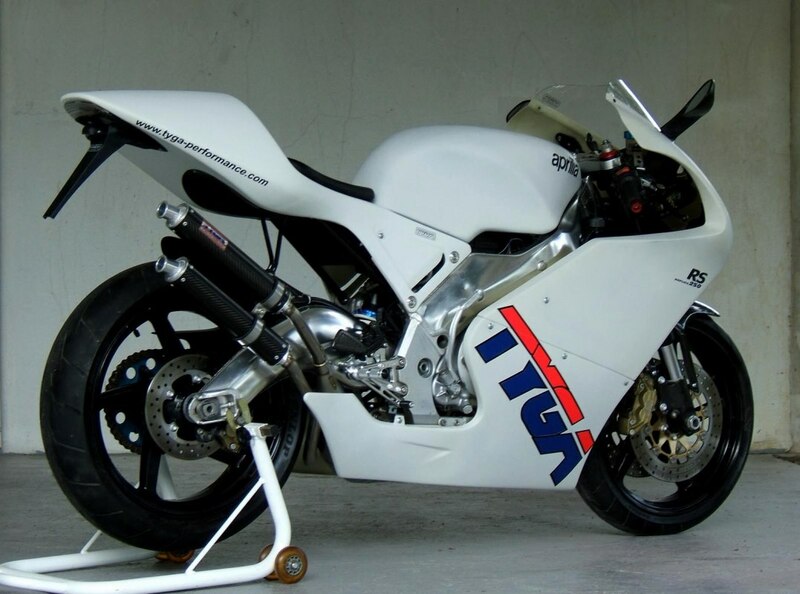 The bike shown here was in a terrible state, what with being used as an exhaust development bike for all this decade, followed by a long stint having fiberglass, plaster and resin thrown all over it. After two days of hard graft it looks half decent, and you can see the potential of what can be done with a simple change of clothes. 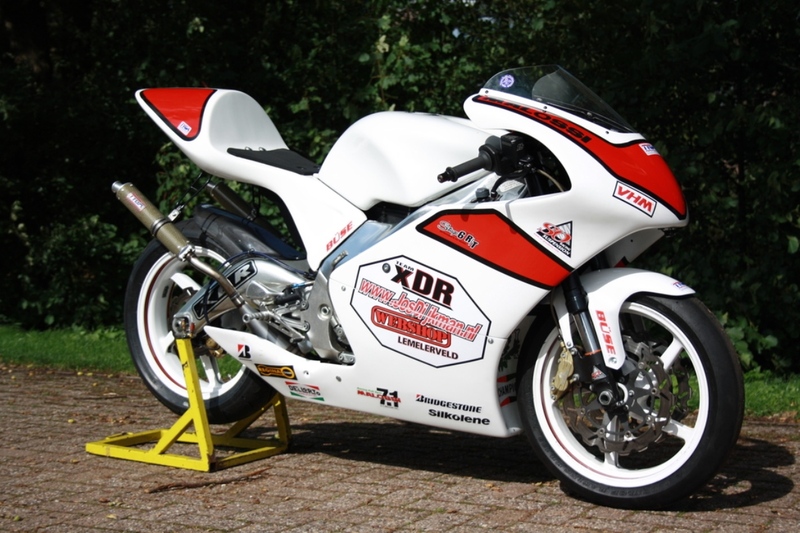 But we really look forward to seeing some of the very special RS250 projects that people are building to showcase this kit. We can't wait! 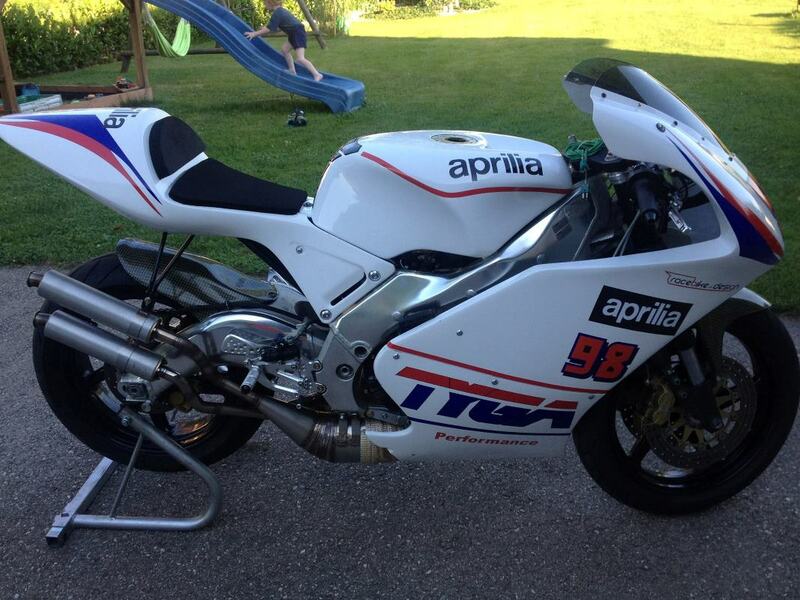 Here's a few samples from some of the projects our customers build using our Aprilia GP bodywork kits.